A beautiful snake, usually under 1 meter, not very aggressive. ©2009 ThailandSnakes.com. Length: Up to 130 cm (1.3 meters). Usually under 1 meter. Range: Thailand and southeast Asia. Notes: These snakes are commonly found near water, lakes, ponds, and in gardens. Recently a friend had one in his swimming pool in Krabi town, southern Thailand. Active Time? Daylight hours. I’ve found them sleeping around 1 foot off the ground in bushes. Food: Frogs, poisonous toads, and fish. I have not seen them eat anything but frogs and toads. Defensive Behavior: Spread out the neck slightly to make themselves appear bigger. Not as dramatic as a cobra. Lift their head and neck off the ground 4-5 inches. Some snakes of this species, and others in the genus Rhabdophis, have displayed a rather unique defensive behavior of exposing the back of their neck and secreting poison from their nuchal glands. This is not all that common unless very provoked. One researcher, Kevin Messenger, claims that the R. subminiatus helleri he caught in Hong Kong actually sprayed a mist of the poison into the air from the back of the neck. Quite amazing, if true, right? 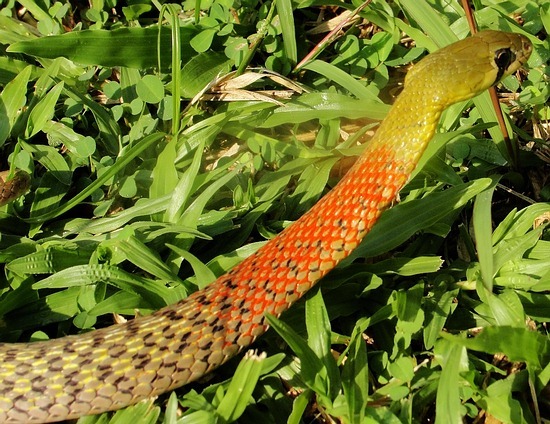 Obviously more study is needed into the secret life of this fascinating snake. 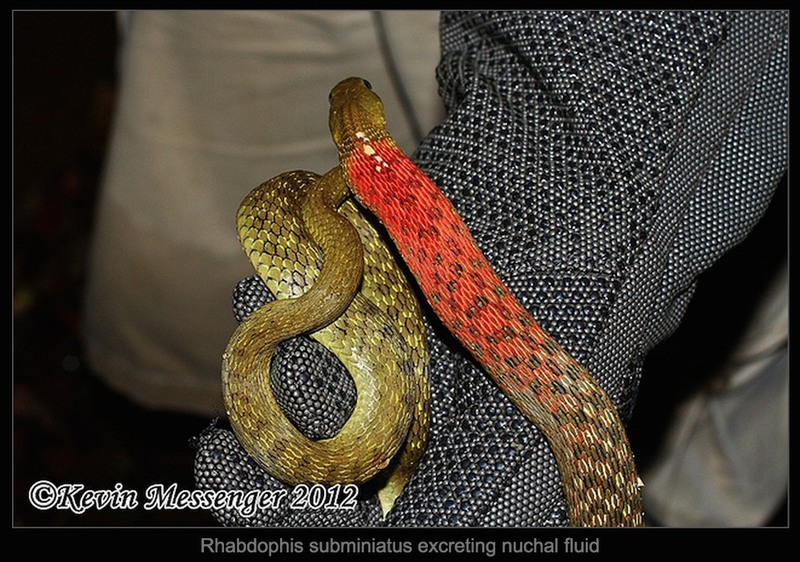 Other snakes in Rhabdophis genus with nuchal glands: R. nuchalis, R. tigrinus, R. nigrocinctus, and R. chrysargos (in Thailand). Here is an image of the snake expressing poison from the nuchal glands. The liquid on the neck near the top of the red shade is poison acquired at least in part, from eating poisonous Bufo toads. Here is the description in a scientific journal about Kevin’s encounter. Venom Toxicity: LD50 is 1.29 mg/kg for intravenous injection (source). That is about the same rating as the very deadly “Banded Krait (Bungarus fasciatus)”. It was previously thought these snakes were harmless. Some kept them as pets and were bitten. In one case the snake was left to bite for two entire minutes before removing it from a finger. Serious complications resulted requiring hospitalization and intensive care. 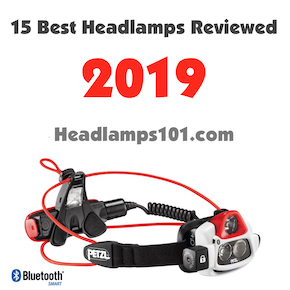 Click for article. These snakes are rear-fanged and need to bite and hold on, or, repeatedly bite to have any effect on humans. Once they do either – there is the possibility of severe problems including renal failure and death. Recently a small boy of 12 years old was bitten by one he was keeping as a pet in Phuket, Thailand and he is currently being treated (11/5/10). Be very careful not be be bitten by these snakes. There is NO ANTIVENIN available yet for these snakes in Thailand. Scroll down for information about antivenin manufactured in Japan that may have some positive effect. In Japan they make limited amounts of antivenin, but it is specifically for their in-country use. Update: The 12 year old boy bitten by the Rhabdophis subminiatus was treated for 2 weeks of intensive care, and released. He was bitten multiple times, the 2nd bite lasting over 20 seconds. Offspring: I had a juvenile red-necked keelback I’ve taken photos and videos of and released into the wild. I cannot find anything much about offspring. Recently (mid-June) I found a DOR juvenile very recently hatched, so like most snakes in Thailand the time around June is when they are hatching out. The coloration of the juvenile is quite different from adults as you can see in the photo and video below. A hint of red on the neck in the juvenile. A pronounced black banding at the neck and grey on the head is evident in juveniles. Notes: These snakes can inflict a deadly bite when they are allowed to bite for longer than a couple of seconds. I know personally of two instances where a child was bitten for well over 20 seconds, and a man was bitten for about a minute. Neither wanted to hurt the snake to remove it forcibly, and both spent over a week in intensive care, with the possibility of renal failure and death. Do not play with these snakes. If you have one, do not free-handle it. Treat it like you would a pit viper or a cobra. The LD50 on this snake for intravenous was stated to be 1.29 mg/kg. That is VERY venomous. As a precaution, any snake in the Rhabdophis genus should be treated with extreme caution. 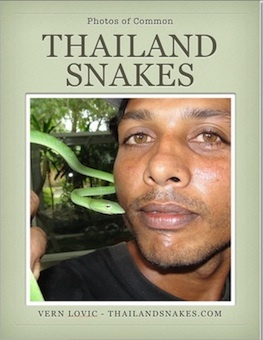 In Thailand we also have the diurnal Rhabdophis nigrocinctus, and Rhabdophis chrysargos, both of which may be able to inflict a medically significant bite if given the opportunity. had one in the garden, not too large, about 90 cm. Very docile. I directed it away with a stick, it slowly slipped away. Fast through the grass. Nice colors. Yes, exceptionally beautiful snakes… especially if they’re scared and show you the colors and flare up – wow. They don’t bother people at all – but so many people kill them – I see Thais do it all the time… sad to see it. But the good news is – there are PLENTY of them – they seem to be everywhere. Found one this morning under the doormat outside my house, in Khao Lak. I have a kitten that likes to run around in the garden so it worries me a bit to know this snake is around and i’ve seen it a couple times in the garden before. Do you think cats can scare them away or they will just attack if the cat tries to play with it. They’ll definitely avoid cats – kittens, whatever is bigger than them and that messes with them. These snakes wouldn’t bite much, they’d prefer to flee. That said, a good bite could kill your cat rather easily I’d think. I was in Khao Lak in 2012 and saw one of these in the grounds of the place we were staying, about an hour after dark, under lights on a footpath. A cat which we’d seen several times around the place was showing a great deal of interest in it. While I went off to get the camera my wife stayed and watched it. The snake struck at the cat and bit it on the lip; the cat immediately started to drool and then ran off. Didn’t seem like the snake got a good grip on the cat so hopefully it didn’t get a chance to work in a lot of venom, but we didn’t see the cat again – we left the next day. Didn’t know what kind of snake it was at the time (I’m from New Zealand, where there are no snakes) and was rather surprised to learn later that they’re so venomous. Pretty little things all the same. Thanks for this site, it’s really informative! Yep, those are super-hot snakes. The power of the venom is comparable with a monocled cobra or a krait. Wicked strong. Thing is, they have a rather inefficient venom delivery system with small fangs in the rear of their small mouth. Only people (and animals) that get bit for a lengthy time seem to be envenomated and have problems. The venom attacks the kidneys. Scary snakes because yeah, they are so beautiful and usually quite calm and non-bitey. Cheers man! i have also caught few of them and some of them really secreted venom from their back…. as he was over 2 meters and did not seem to happy to be disturbed. Yes, the red-necked keelbacks are fast, but always to get away. They don’t hang around to strike. Only if you pick one up or step on one, might it bite you. The king cobra eating a toad was most likely the Ptyas carinatus or Ptyas mucosus – both big rat snakes that resembled the king cobra. Unless you’re positive. 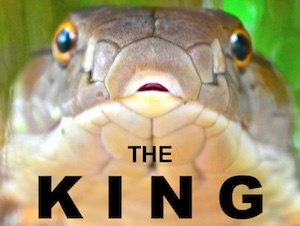 That would be a new one on me though, kings are almost exclusively snake eaters. They do take monitors too – bigger ones. Cheers, and thanks for the comment. I just used your website to identify a red necked keel back found in the garden here in Krabi. Thank you for your fantastic useful site. Have bookmarked for future reference. Just seen a Red Neck Keelback snake around Pai, trying to hide in some long grass tried to scare it away, but it seemed very friendly and wouldn’t go away, it eventualy disappeared into the undergrowth very beautiful snake though. We just saw one too – a great specimen, no ticks or injuries to scales or tail. They are stunning. Dangerous though! This little snake, the size of my index finger, bit my cat (somewhere in the mouth area) who was trying to tease it. The cat ran and so did the snake, very fast in the grass and hard to spot. My cat immediately foamed at the mouth which lasted for about 15 minutes. it then suffered spasm on its legs and it tumbled forward when it she was trying to walk. She’s two years old and weighs 4 kgs. I called my local vet and she ordered an injection at the nearby pet clinic. I administered the shot subcutaneously. The cat was fine after that. We are in the mountainous area of Kampot. That’s really interesting – thanks for the story. I have no idea what happened there. The snake is rear-fanged, is not built for envenoming, it needs to bite for either a prolonged time, or repeatedly to work venom into a bite. However, a bite by this snake on the mouth, introduces another variable… this snake has poison glands – Nuchal gland(s) on the top of the neck, and it’s possible your cat got some of the poison in its mouth I guess. No idea what the shot contained – if you can let me know, that would be great. Cheers! I am from north eastern part of India and I must tell you that the red neck killer back snakes are available in my village . I don’t know about other parts of the state or country but in August September months it is seen the most.Even it entered into my room two months back. I searched and found that the snake was the red neck killer back snake. 3) can shrink its body to pass through a very small hole. 4) can’t tolerate the smell of kerosene. I disagree for #2. Never saw one climb anything with speed, certainly not a vertical hill if that’s what you’re saying. 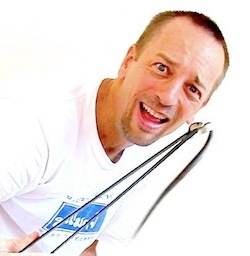 #4 – can anything tolerate kerosene? Great site. Loads of these fellas around where I live in Laos. I usually see at least 2 or 3 every day. I often see them in low vegetation or among stacked timber with an unfortunate frog in their mouth – always hear the frog moaning first! Although I have seen a few moving very fast across the lawn, they mostly appear to be quite docile. I didn’t know they are so venomous – always thought they are only mildly so (enough to kill a frog or small rat). I often pick them up and take them away from the house or where the kids are playing but I’ll now be much more careful. We found several of these snakes during construction of our zip line inside Angkor Wat Park . A few that we found were close to 2 meters so they can get large. Not aggressive but still handled with respect and we relocated to remote areas for release. Fangs on this snake are located in the back of the mouth. Sadly, I killed one yesterday. My kitten was playing with it and I thought better of that. I had no idea I was in any danger however. Very pretty and lightning fast. I feel a bit bad about it. I suppose I should say thank you for identifying the snake for me and accept my regrets on killing it. That one isn’t likely to kill anybody or any cat, but if it got a good bite and held on, it’s possible. Saw loads approx 8 by the monkey swimming hole in Khoa sok Thailand this morning…we have been swimming in the river all week with our kids 2 & 8yrs old…only seen them today though…we are thinking the heavy rain last night might have flushed them out! Hi Vern, here is my redneck story. A few months ago, we went out the back side of the house, (Pattaya) and the wife screamed, A snake bit our cat! So I told her to take care of the cat, that was foaming at the mouth, and I would find the snake. Lifted up a stone slab, and there it was, coiled up, but the biggest surprise was a huge cane toad, sitting next to the redneck. I knew the snake was a redneck, since they are almost the easiest snake to reconize, But I didnt know if it was venomous or not. I didtnt have my snake catcher near by, so decided to kill it, then put the toad in a plastic bag, and dumped it in the neighbors yard!! hehe. So, was my cat poisoned by the redneck or the toad? Was the redneck going to try and eat the toad, and decided it was too big, or what? Is the poison of the toad, the same as the redneck, that he excretes from his neck? Why would they be sleeping together? I hope you can supply some answers, this seems to be a weird situation, and internet doesnt help, every web site has different facts, and most get poison and venom mixed up. Fortunately the cat survived. Also if im ever in a quiz program, and asked how many poisonous snakes there are, I can now say, only one!! Unless another is found! Thanks for you help! I will be trying to find some answers to these questions for a long time. Hahaha! Interesting… I’d guess the cat was toad-licking. I don’t know what the poison consists of on the redneck keelback’s neck… but it likely closely resembles that of the toad. At least that’s what I’ve read. 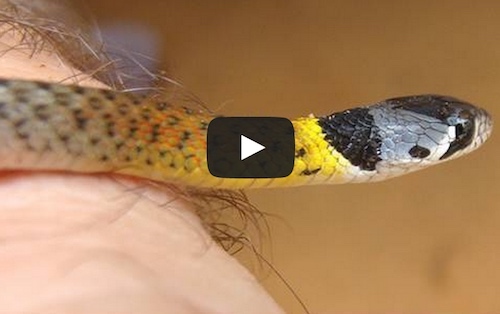 A rednecked keelback bite to the cat wouldn’t cause a reaction like that (foaming)… I don’t think. Must have been through the mouth. I’d guess your cat can now be considered a toad licker for sure. Did the keelback have bite marks all over it from the cat? If so, that cat might also be a snake licker. No, I really didnt examine the snake, but of course should have. Should have also examined the toad for bite marks, but he looked so peaceful. Seems to be more and more snakes in the estate, but maybe I just can see them better now. Also I will leave the toads alone, and listen to the wife a little more. Thanks for your quick reply, Im sure I will have more questions later. Seen many in my garden in Chiang Mai, the juvenile was very cute, didn’t realize it was venomous, Packed in a bag, but it managed to escape. I saw one of these in the road on koh lanta with cars driving past only just missing it.. being an animal lover I couldn’t bear the possibility of it being squashed so picked it up halfway along its body and put it in a bush.it was docile and didn’t react when I first tried and failed to pick it up with a stick so I used my hands. I decided to look it up and came across your website only to learn it’s a pretty venemous snake!! I’m still glad to have saved it but won’t be doing that again.